The subject of the article is very demanding and I am going to touch much conceptual stuff in this article. thus I have tried to keep economic jargon as brief as possible. simultaneously I have tried to answer all possible questions that might arise in your mind while reading this article. as per the title of this post, There are 4 broad areas that I have tried to elaborate. Depending on your requirement you can simply jump to the relevant part of your interest. However if you are new to economics, then I will recommend you to go through the article sequentially. NOTE: This article is for understanding purpose only and and although the concepts and data mentioned here are valid and correct, they are expressed in very simple manner. China`s role in USA`s economy? the crisis: the rich countries in deep debt? Economics is not a difficult discipline to understand but to understand an event in economics, you are supposed to know all associated factors and concepts, and that makes this subject challenging. So to understand Euro zone crisis and Policies of deregulation going in India you will need some basic understanding of economics, which starts with fiscal deficit And then little about GDP and growth rate. A government (G1) runs like a home. You earn money from your job and then you spend it on your daily activities and when you need more money than you earn, you simply borrow it. Similarly government earn money from various sources like taxes and duties, public sector company revenue etc. and then it spend this money on government employee salaries, developmental projects etc. government need money equal to its fiscal deficit to carry out its business; but devoid of internal sources of tax n duties, government take help of other means i.e. it resort to borrowing money and it issues bonds. (bond, in general terms is a fixed deposit account) besides bonds, which are purchased by either financial institutions(big banks) of the country or mostly by other country`s government (G2). But funny thing is other government G2 is also suffering same problem of fiscal deficit like G1! Well, the answer is simple; today the governance has also become a business. Let’s understand this with an example of US and china. and then you will also understand why n how China is said to be a world power. for 2010 China`s GDP is ~$5trillion and fiscal deficit ~223billion while USA has GDP of $15trillion and fiscal deficit of ~$1.5trillion. 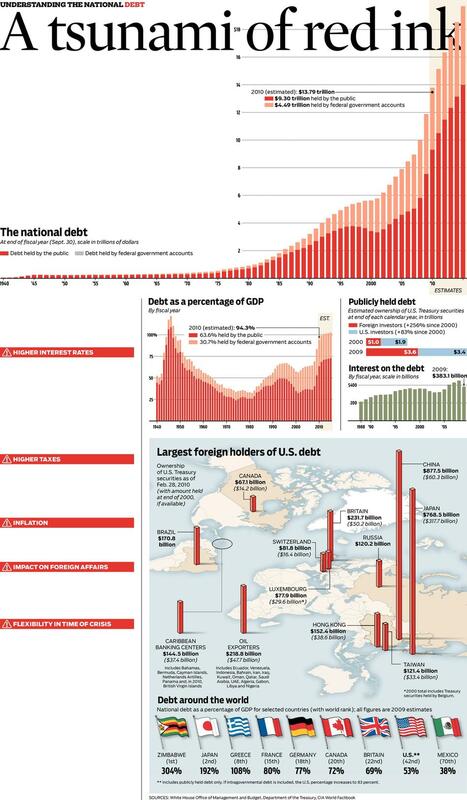 thus considering the hugeness of amount, obviously USA`s fiscal deficit is more as compared to china. To fill this deficit government of both countries will issue bonds. as matter of fact, USA being the richest country, it is considered as safe place to investment. also the government of USA has never defaulted! and value of US dollar hardly fluctuates and mostly it appreciates making more returns at maturity for the bond. so with this lucrative offer, Suppose china buys these bonds and invests their money in USA fixed deposits. then china has a security that USA will return its money after maturity of bond plus china will get some interest on these bonds! And from where china will get that much money? Simply via the ‘made in china’ stuff! The international trade is carried out in US dollar only; and china has plenty dollars earned via the export based trade, as the international trade is carried out via US dollar. (for same reason, USA has strongest economy!) so there cannot be a better and safer place than USA to invest the huge chuck of money! Above all its china`s money that will be supporting USA economy(as it is fixing fiscal deficit) so obviously USA will have a soft side towards china. And this hugely matters in international politics. (Obviously you will be grateful to the person who is helping you.) Thus china prefers to invest in USA`s debt. why not print more currency to fix deficit? So in simple language, the money or a note of Rs.100 or Rs.500 that we use is issued by RBI against some fixed tangible asset owned by the government. traditionally This asset was gold as per gold standard; that is a central bank was supposed to keep gold of same amount aside to print notes. however with maturity of economy today it is carried out on basis of bonds. Here the government issues bonds to central reserve bank, and upon this bonds central bank issues currency. Thus a wise government never opt to printing more currency to fill the deficit. The more the GDP and growth rate higher are the chances that the country will not default and will repay the debt on time. USA with 15 trillion USD is highest GDP country in the world, 3 times more GDP than 2nd GDP country i.e. china! This is the reason why every country wants to invest in USA and this is the reason why US dollar is such a strong currency and every country wants a share in it. But all this has changed with turmoil of USA sub-prime crisis i.e. recession of 2008. And this is the basic background you will need to understand further analysis. All was going well until the subprime crisis (for layman, recession) struck. during this time most of the businesses and funds from European countries were literally vanished just like they described the recession: a bubble burst. now, I am not going in details of subprime crisis as it’s another complex phenomenon*. Just remember: in the recession huge investments were lost, leading to bankruptcy of corporations, leading to unemployment, leading to regression in GDP and growth rate. And the real Eurozone crisis began. In general terms it can be also termed as credibility crisis and is much critical than just recession which was about bankrupt corporations where the government was capable to bailout them with provision of necessary funds to rejuvenate their affairs. 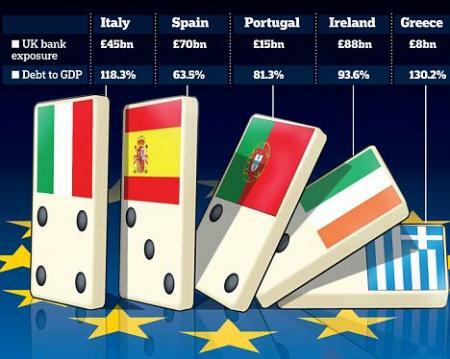 Here in Eurozone crisis we are talking about bankrupt nations! Post USA subprime crisis, Greece along with Italy and Spain owes debt of ~$367billion, ~$1trillion and ~$1trillion respectively. As mentioned above this debt is product of fiscal deficit and all this debt was provided by G5 heroes from Europe i.e. UK, France, Germany. The bigger economics of the region. To get the money back from the wretched PIGS i.e. (Portugal, Italy, Greece, Spain) it’s necessary to ‘bail out’ them and to do that more money is needed! But where is the money? Post-recession 3 heroes of G5 are already down and then USA itself owes a debt more than what the entire world produces in a year! And Japan divested in earthquake plus similar debt. Thus, after recession no one wants to risk their funds in investing on a defaulting country with a low GDP and growth rate. And even these PIGS might say that we will give your money back, the investing countries are not ready to trust them and have denied to extend their investments. And this has created the multimillion questions, who will be the saviour of PIGS? Traditionally international monitory fund( IMF) has been intrusted this job but European countries have taken this crisis as very personal as identity crisis of their euro. They want that European central bank(ECB) to solve this crisis but truth is ECB simply don’t have that much funds. Also, during such crisis obviously other countries are looking to so some politics in their interest which is hidden for us layman. In any case IMF and ECB will strike a deal to bail out Greece and then the rest of economics. There are other ways out, but for understanding of the crisis this much info is sufficient. and anyhow the developed nation will have to resolve this crisis as they cannot afford PIGS to default as their default can lead to complete failure of world economics! The biggest problem with Europe is their aging population, where the govt. need to spend huge chunk of amount on social security of elderly peoples. In case of India we have an advantage of youth at work with 65% population under age of 35 years. a golden opportunity of window that we need to seize. On the other hand in Asia, India has a fiscal deficit of ~$60.1 billion (~8% of GDP, while fiscal deficit more than 5 is alarming for an economy!) but Indian economy is much strong(GDP>$1trillion) and growing(growth rate>7) so the world is not worried about its ability to repay. however, in Asia India is one of the high public debt country. Taking lessons from the free-fall of world economy and impending risk of double dip recession, government of India has decided to opt for policies of deregulation. That includes deregulation of fuel prices for which it is providing huge chunk of subsidy. To tackle inflation, government needs to implement new policies of increasing production, setting new production and manufacturing units creating new employment opportunities but with global meltdown such efforts by government are turning futile. also the internal turbulence like political agitations are making administrative efforts difficult. the corruption charges has further aggravated the situation! now, you might ask why government has borrowed so much money? and why such huge fiscal deficit? well, India is a developing nation with more than a billion population, our government is supposed to look after them and simultaneously carry our the developmental projects like building power plants, bridges, roads, dam etc. Thus, the fiscal deficit is not going to reduce unless government either stop developmental project or the wale-fare activities like subsidy or spending huge amount on defense! of course even you will also opt here for containing some wale fare activities i.e. subsidy to the well of people, and that`s what government has oped by deregulation! Indian government`s steps are proactive in nature; they are towards reducing the 8% fiscal deficit as minimum as possible (4.6%) so as to avert any possibility like Greece. (possibility is much unlike as we are a strong economy) We have faced such embarrassment in 1991 when India was made to open its market by force.In any way India cannot afford such crisis to happen again. Also as the price is now controlled by market forces, change in value of rupees with respect to US dollar also matters. With change in 1Rs in global market, it costs around 8000crore rupees loss to the Indian oil Manufacturer Company annually. Again these companies are government owed, so at the end of the day anyhow we are the one to pay for it. By immediate price rise we pay it right away but with subsides, economy is always threatened by debt and followed embarrassment. thus i think the steps of deregulation should not be opposed. BTW, inflation is the integral part of monetary system and over a long run inflation has to make things costlier, remember what your grandpa or grandmother used to say about commodities during their time? with higher growth of economy higher inflation occurs. what is happening in India now was supposed to take place over a period of time, but our economy has really grown faster and thus the inflation got worst! but see, even though things are costly people have money to buy them! that’s what i am trying to say! and that`s how system works! so that`s all about whats happening in global economics; and although its given that inflation and related events are part of the system, you are free to abuse your government for wasting money in corruption, delayed projects and all. that is what expected from aware citizens, there in lies ethos of democracy! make your government accountable! So wake up! Educate, unite, and agitate! I hope that this will help you to understand something about lot of things happening in global economics crisis. *the figures of GDP and fiscal defecate are taken for year 2010. Fun story: few years ago, with 304% GDP to debt, all of the world countries denied further aid to Zimbabwe. so the government was left with no other option than printing notes to fill the deficite. and in this the cetral bank of zimbabwe had issued currency of 10billion, 100billion Zimbabwean dollar! such was the dilution of assets and inflation. thus to buy a a car people had to carry cash full of truck! India has a fiscal deficit of ~$3trillion (~8% of GDP, while fiscal deficit more than 5 is alarming for an economy!) (i.e. even more than Italy+portugal+spain!) but Indian economy is much strong(GDP>$1trillion) and growing(growth rate>7) so the world is not worried about its ability to repay. I am a working mother of a 8 yr old, as I work with my child on her school work -I can’t help think about the meaning of education for kids who either do not attend school or do it just as a motion without understanding ‘why’ they are doing it. Just came across your blog while searching for some education related topic and am touched by your thoughts and work .. and would like to see you continue with it.